Home / Health / Spirometry-or How Do Our Lungs Feel? Spirometry-or How Do Our Lungs Feel? Some observations on spirometry.What is spirometry and why is this important study? 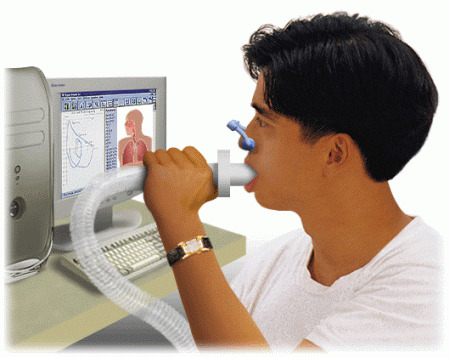 The spirometry is a method for determining lung function with a special apparatus. The study is noninvasive and takes about 10 minutes. It helps for early diagnosis of chronic obstructive pulmonary disease (COPD) and asthma. As the measurement of blood pressure leads to early diagnosis of hypertension, prompt treatment and avoid the occurrence of heart attacks and strokes, and spirometry help identify patients with COPD. Unfortunately three quarters of patients with COPD are undiagnosed. Why lung diseases are overlooked? Is it true that many people living with lung disease without knowing it, and the consequences for them? Unfortunately, society has had the notion that there is "tyutyundzhiyska cough", ie normal smoker to cough and remove phlegm. This is a great delusion. A cough lasting more than two months, a sign of disease must be diagnosed by a doctor. What are the symptoms of the most common lung diseases? How to recognize them? The most common symptoms of lung disease attacks were shortness of breath, dyspnea on physical exertion, cough and sputum. These symptoms are characteristic of many diseases. Therefore, the patient is unable to set itself diagnosis. It is important to realize that the symptoms need early diagnosis and timely treatment, such as COPD is the third cause of death worldwide after heart disease and stroke. Is there a "former" smokers? What happens to the lungs of smokers and I can fully recover if they stop smoking? There are former smokers who were able to part with cigarettes. Unfortunately, the lungs of smokers may not fully recover. At the same time I want to emphasize that the lungs have stopped smoking in much better condition than those of people who continue to smoke. It should be borne in mind that smoking is a risk factor for other diseases with the highest mortality - heart attacks and strokes. In Bulgaria step is the adoption of the ban on smoking in public places and indoor. It has been shown that such measures tend to reduce the number of smokers.Given the ambiguous reactions to the law I want to emphasize that Bulgaria should learn to protect the public interest. For example, restaurateurs are worried about their income, but if you think like them, and we doctors have to worry about, since the smoking ban will reduce the patients and consequently reduce the number of "clinical pathways". We as a society need to go beyond private interests in the name of the most important - the public health.